December is around the corner and you need to start thinking about your holiday promotion ideas if you haven’t already. To make things easier for you, I’ve put together a list of ideas that could inspire your web push notification campaigns this holiday season. Without further ado, let’s get straight to it! Weeks leading up to Christmas customers are on the constant lookout for the best deals. To keep them coming back to your store, have daily or weekly promotions for specific goods. 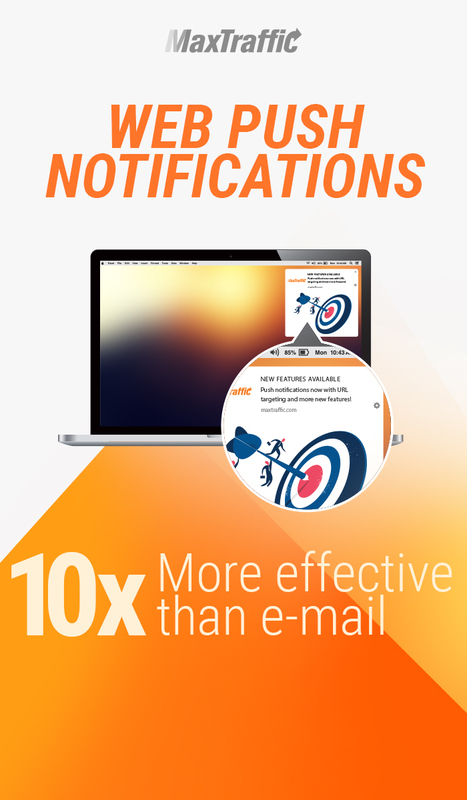 Most importantly, remind window shoppers about these deals by sending a web push notification. If you have to offer more than one deal at the time, make sure you carefully target who gets to see the notification. To increase the odds of purchasing, target customers who have previously visited a certain page or product category on your website. Gift giving is a truly rewarding experience, gift hunting on the other hand – not so much. As shoppers are busy looking for the perfect gifts for their loved ones, take a weight off their shoulders by creating a holiday gift guide. Gift guides make a powerful tool during the holiday season as they allow showcasing your products to those shoppers who are eager to make a purchase. To stand out in the crowd of competitors, run sales campaigns that are a little different from the norm. Start with a specific color sale. Color sale is a great way to showcase different types of items that can be found in your store. And the great thing is that almost every shop that offers goods in different colors can run a sale like this. Follow local weather forecasts to create fun and engaging messages that drive conversions. Is the temperature going to drop on the upcoming weekend? Run a special promotion for that kind of weather appropriate goods which can be found in your store. And just in case you forgot, not everyone in the world has to endure cold wind and snow during this time of the year. That’s why make sure you target users by countries when it comes to this one. Holiday events give you a great chance to meet your customers and build lasting relationships with them. That’s why seriously consider organizing a fun Christmassy workshop or new collection presentation in your local store. If you don’t have a physical store, think about setting up a Holiday popup shop or getting a place in Christmas markets or craft fairs. And of course, let your customers know when and where they can come and meet you. If you are releasing winter holiday collection, you probably want your customers to know about it. Even if it’s not a winter holiday collection per se, but just a list of things in your store that could be considered season appropriate, you can still invite your website visitors to check it out. Gift sets make great holiday presents as they usually contain only the best products the store has to offer. Not to mention that gift sets are always beautifully packaged and ready to be put under the tree. If you still have time, play around with the idea of creating gift sets. And if they are already available in your shop – promote them! Sometimes gift cards can be one of the best presents you can give to someone you don’t know or don’t feel confident shopping for. If your store offers gift cards – great, remind your customers about the opportunity to purchase one (or more). And if gift cards aren’t available in your store, seriously consider making it an option. Finding sock-worthy gifts can sometimes be quite a challenge. To save your customers from yet another holiday worry, make a list of quirky and heart-warming items that can be found your store and used to stuff a Christmas stocking. It can be small toys, candy, travel size products or anything you can think of that can fit into a sock. Winter holidays are all about giving, so why not surprise your customers with an exciting giveaway or a contest. Running a giveaway or a contest can not only bring you a return on your investment but profit as well. How, you wonder? By gaining product exposure as well as connecting with your customers and generating more leads. In a perfect world, everyone would love not to worry about their holiday shopping budget when it comes to buying gifts for loved ones. Unfortunately, some have no choice but to look for value deals that make thoughtful and useful presents. Help your visitors find value deals in your store. Promote your best value deals that can still make shoppers feel good about giving! Do you have a gift wrapping option available in your store? Great, make sure your shoppers know about it because it’s something they might be truly interested in during winter holiday season. Studies show that shipping charges dramatically influence conversion rates. On spending seasons like this, the very last thing you want to do is discourage your customers from finishing their purchases. If possible, try dropping your shipping prices to encourage shopping on your website. Ideally, you’d like to offer free shipping with no minimum cart value. However, if it’s something you can’t afford, consider making the minimum cart value lower than it normally is on your website. Bring new customers to your store by using private promotional codes to target first-time shoppers. To avoid unpleasant misunderstandings, make sure your push notification is delivered only to those visitors who haven’t completed a single purchase on your website. Consider running a special promotion for loyal customers of a certain brand. It’s a great way to spark the interest and bring users back to your store. You can reach out with the news to all of your visitors, or only to those who have purchased goods of that particular brand before. Without doubt, winter spending craze is a great time for obtaining new customers. But don’t forget those who have been with you for a while. Create winter holiday rewards program or special one-time offer for your loyal shoppers only. Even though some window shoppers might not be familiar with your store they still can have a vast interest in what you have to offer. And that’s when “Best-selling” section on your website can double as a roadmap for those who are not sure what should be their final destination. During winter spending season, a need to find and buy a very particular item grows immensely. It’s a pity if that item was out of stock at the time the customer was visiting your store. To make things better on both ends, notify your customer about items of their interest that are available again. A simple message like this has a great conversion potential, especially when carefully targeted and delivered to specific individuals. You probably know that promoting urgency encourages shoppers to make a purchase faster. By delivering last minute deals or last item announcements, you are likely to trigger the interest of a customer to take a plunge before it’s too late. The holiday spending madness doesn’t end after all the presents are handed out and unwrapped. In fact, most stores offer even better deals after Christmas and shoppers are well aware of that. Post-Christmas sales work well for online businesses that sell apparel, accessories and other things that can also be considered as Christmas merchandise. If you don’t have Christmassy goods to get rid of, run end of the year sale instead and make some room for new season collection. Winter holiday spending season is big and you want to start preparing early in order to meet your revenue targets. When preparing your holiday promotion ideas, focus not only on offering great deals but also on creating a pleasant shopping experience for the customers. By the end of the day, you want your customers to come back to your store even when holidays are over!